3. A search on the English caption found many additional uses but none seemed promising. 5. 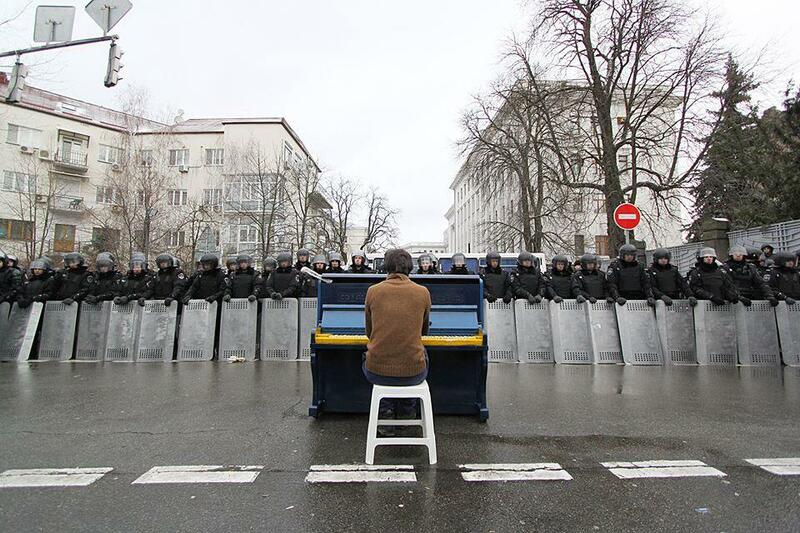 A search of the Left Bank site for piano (піаніно) and pianist (піаніст) and review of recent images came up empty. 10. in a comment on a reshare of the image by Anastasiia Bereza, Oleg, one of the protest organizers, explains “Thank you all! Use the photos on your own, it is common property and collective authorship” and explains that the photo was his idea, that Andrew Meakovski is the photographer and Markiyan Matsekh is the pianist, and that although it wasn’t really staged they did ask people to move away a few steps for a moment. What is fascinating about this convoluted journey of one image across the web in less than 48 hours is that it rapidly hopped from one social media network to another and another (Facebook to Twitter to Google+ to blogs to Twitter again) and that it was variously credited along the way to several different sources before losing attribution completely. A news service or anyone trying to source the image might have a very difficult time tracking it down. Last month a jury recently awarded news photographer Daniel Morel $1.2 million after finding Getty Images and AFP guilty of copyright infringement for misappropriating Morel’s images of Haiti earthquake from Twitter even though they knew (or should have known) the source and sought permission. This situation is different since the image was actually made by the protest organizers who were keen to have the image published to further their cause. However, considering how fast it spread and how it jumped from service to service, there really wasn’t an easy way for a prospective publisher to find that out. Tracing back to the source takes time and perseverance. Interestingly, in the same two hour timeframe that it took me to track down the source using search engines, Jeremy found the same source through his multiple twitter contacts. Wow, some very polarised views here and people interpreting comments very differently to how I did. The only thing I can see that everyone agrees with is that copyright laws need changing! One thing I would specifically comment on is that the Getty/AFP/Morel case is very different from what is being discussed in this case, where innocent (in the broadest sense) individuals were involved, not large commercial companies who should have known better. It strikes me that the basic problem lies in both the nature of the medium and the technology that supports it. Combine that with a confused bunch of ‘users’ with no clear guidance on what is best practice or even just decent, let alone the law, and it’s a recipe for the chaos that ensues. And the sad thing is that in almost all cases no-one sets out to intentionally upset anyone, and if they had a helping hand they’d be more than happy to do the correct thing (as this case shows with the fact that three people took the trouble to provide attribution, even though they got it wrong). But isn’t technology part of the answer? When you publish an image, embed copyright information. When it is saved, modified, shared ensure that that information persists (one of the almost ubiquitous failings of current social media platforms which strip out metadata). Wherever it is published make sure that that information is readily accesible (for example on Flickr you can see EXIF data extracted from the uploaded image – http://www.flickr.com/photos/whatsthatpicture/12001016953/meta/ – and why not make a right-click option available in every modern web browser to view basic exif/iptc data on any image?). Then that crucial trail would not be lost at every step. One interesting detail in the study was that in three of the postings the photo actually was credited, including once with the © symbol and yet none of the attributions correctly identified the author. Rather they simply identified the place where the poster found the image, one step back in the chain. Whereas search by image can find where on the internet an image has been used, it is quite a different matter to determine which, if any of those, are the canonical source (creator or licensing agent). As it turned out with the piano player the original source was only identified in Facebook, and not in Google Image Search or TIneye. Would be ideal if social media sites asked image author via a field. While it would provide a consistent process improvement it still would be hinged on human input and their lies the problem. No matter what we’re dependent on people knowing what the right thing to do is. Ultimately though this is of greater value to photographers who are the minority. The vast majority of people see the value in image viewing as entertainment not being the keeper of proper citation and credit. I certainly agree that it can be difficult to track down the owner of an image and the copyright holder. not] Since I can’t find the owner I will use it without authorisation. 2. I can’t find the source. Therefore I can’t get any authorisation to use it. So I will not use it. Many will think that #1 is OK. It is not. It is copyright infringement. #2 is the correct conclusion. which is a sad, and restrictive perspective which withers our collective spirit. ‘Copyright infringement’ is a weak cry, in response to the enthusiasm that should arise from wonderful art. Attribution is a wonderful thing, but creation of information does not entail ownership of same. Not all uses are or should be banned, lest we impoverish the world with our absurd desire for control of our art. That is a lot of fancy word for promoting copyright theft. “creation of information does not entail ownership of same” is not correct. Creation of information, or more correctly a creative work like photography (or music), DOES entail ownership of same. You may not like it but that is the current legislation. And that is how artist (be it photographers, musicians, singers, film makers, authors, painters or others) mostly can survive. Because creation DOES entail ownership of what is created. It is just like movies. Copy the movies and distribute them through bittorrent or whatever free sharing tool you can find and you may feel good about it but it is still illegal unless you have the authorisation of the film-maker. Just like copying and sharing photographs without the authorisation of the photographer. Creators who want to share their “art” freely can do so by granting blanket authorisation (e.g. Creative Commons). If they have not, then you are stealing their material if you use it. you are of course welcome to choose to follow that belief. But it is a foolish worldview, in my opinion, that you may find is much more costly to you, personally, than adopting a less heavy handed, more realistic business model, while at the same time minimizing the positive impact that your work can make on society. Typing in capital letters may make you feel you are speaking some TRUTH which is self evident, but you are merely making an assertion, that is not in any way a requirement. Good luck with your chosen tactic. I suspect you will find it more costly than you believe it to be. There are better models to follow. You know, it is not so much a question of belief or a specific world view. It is a question of knowing and understanding what current legislation says. It seems you may not quite have arrived there. Or you may have the belief that you can ignore current legislation because it does not suit your philosophy or world view. You may find it costly to have this view of the world, that one can ignore the law when it does not suit one, just as Getty Images and AFP found it rather costly when they followed the principles that you are advocating and were condemned to pay $1.2 million in damages. If you don’t like it you might find it less costly (and more intelligent) to try and change the law instead of ignoring it. Of course that’s our classical understanding Per. This case is interesting though because of the very high and immediate news value of the image and the fact that it had spread so rapidly across the internet. It is the technology that makes this possible and tracking down the source can actually be quite difficult. More and more often now news sources, at least the less formal ones, blogs etc. will not be so careful. As it is the image was intended to be widely published so anyone who did trace back to the source would have discovered that. The remedy I believe is to use the same power of the internet to make the search much, much easier and more reliable. If there were an easily searchable repository of all images produced by professional photographers, news outlets, stock agencies or any person interested in licensing or attribution, and if uploading were as simple as drag and drop folders of thousands of images, and if Google and other search images could recognize that repository as the canonical source of an image, and provide easy steps to contact the source, then the problem would be greatly simplified. What you seems to be saying is that “the end justifies the means”. That is rarely an ethical standpoint, but usually something used to defend a reproachable action if it has a good purpose. Then what you seem to be saying is that “if a photo has ‘high and immediate news value’ then it is OK to disregard copyright”, is that not a correct interpretation? If so, the conclusion would be that you think that the “Daniel Morel judgement”, awarding damages from AFP and Getty is wrong and that you think that AFP and Getty was right in not paying attention to copyright. In effect, I think it is difficult to claim that “urgency” justifies infringement of copyright. “Urgency” in whose eyes? – you say “professional photographers”. Anyone, be it a professional or an amateur, owns the copyright of what he has created. Would you expect everyone to register every image in such a centralised registry? It won’t happen. In fact, the onus is on the user/publisher. It is the user/publisher who must figure out who owns the copyright (just like you did for the piano player). If he can’t find out then he should not use the image, not even if he thinks it is “urgent” or “newsworthy”. I can’t see any good reason why that should change. Actually I am not saying any of those things you suggest I “seem to be saying” and I am well aware copyright law in all its details. My main point is that with the current technology of the internet images do in fact spread very quickly, whether photographers like it or not, and they do so without any real concern for the most part with existing copyright laws and constraints. That’s the situation we find ourselves in. Wishing it were otherwise, or chastising people who share images for ethical “lapses” doesn’t help. It is more helpful I think to focus on those situations where a publisher (a real media outlet like Der Spiegel or the New York Times, or even Getty Images) wants to use a photo they find and in social media, particularly when it relates to a breaking story, and has to track down the source for permissions. With the introduction of Google Search by Images and Tineye it certainly has become easier than in the past, but even then as I show in the post, finding the canonical source can be quite a task. There are things we can do to expedite this, by building a better, more comprehensive searchable source. I disagree that it “can’t work”. DMOZ was a hand crafted registry and real a very different proposition altogether. I use “seem to be saying” because it is not entirely clear to me what your argument is. Therefore I do my best to interpret what you write and restate it so that you can tell me if my understanding is correct or not. But it seems (again) that what I read into your text was not entirely what you intended with it. I am less certain that today’s technology is a reason to accept as normal wholesale copyright infringement. But I imagine that that is not what you are saying either. There is a tendency today of people to say “you put it on the internet and then it is OK for anyone to use it”. In particular when it comes to photography. Most people still do understand that texts have a creator and that you cannot just copy them. Same thing for music and films. But not for photography. if you like, as i said, you are welcome to your beliefs. thankfully, the laws you defend so strenuously do not reach so far as you believe, the numerous high profile strongarm punishments you list notwithstanding. $1.2 million in ‘damages’ for a company like AP is a slap on the wrist, more than anything. Look, ill acknowledge that many established businesses have been built around the traditional 20th century outlook you defend. But that hardly means it is the sole approach, and regardless, business is hardly the sole activity to which creative endevours lend themselves. Like many archaic laws, it is simply more costly to defend, than to oppose. Its simple energetics, and businesses which depend on high cost approaches to defending their business model are not going to be competitive. Lawsuits are simply not an effective tool for copyright control of information. I thought hard-core intellectual anarchists were a thing of the past. Apparently I was mistaken.